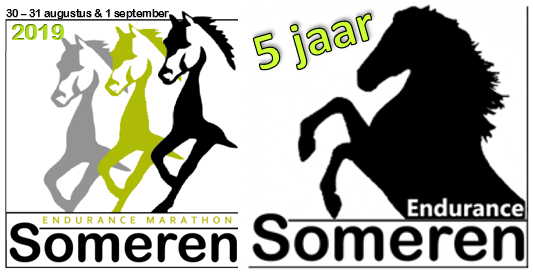 The second edition of Endurance Marathon Someren will start on August 24, 25 and 26th, 2018. We are looking forward to welcome you to this 3-day endurance event. The scenery is various, countryside villages, forests and heather fields. The start, vetgates and finish are located on different locations. This year we finish at PCK Eersel, where also the European Championship Working Equitation is on this date. The 3-day marathon will not be on a marked trail. You have to navigate by GPS to find your way. Often we will follow the existing horse trails who are presented. During the ride, two vet’s will be checking the horses before and after the ride. Camping and paddocks are including the entree fee. Stallions must be hold in stables during night. Please reserve at registration. Your horse needs hoof protection during this event! You can ride without a groom, checkpoints with water will be available on trail. We organise a ‘shuttle-service’ to pick up your car and trailer from the previous location. Around 19:00/19:30 pm you can join the dinner buffet. You need a riding permision of your national federation during this event. Vet check and starting times a noticed in the time schedule. Be on time for your vet check, participants of higher classes going first true inspection. * Cancelations after August 16th, full amount. *If you want to arrive before 23.08, please send an e-mail, we will reserve the accommodation for you. **Hay is not included, please bring your own. We do have a limited availability of renting GPS devices. Please notice at registration. Cost € 30,- + € 50,- deposit. GPX files are already installed. Bring batteries AA. Registration ends on August 16th, 2018. You need te pay your invoice before August 18th to confirm your entree.